There were two clear victories after Monday’s Supreme Court announcement that the Justices would hear the government’s cases defending President Trump’s two executive orders. One was for an imam named Dr. Ismail Elshikh, whose mother-in-law in Syria will now be able to travel to the United States. The other went to John Doe, an anonymous lawful resident who has been trying to get his wife home from Iran. Their victories came in the form of exceptions to the orders which allow their families to be reunited. The rest of the Court’s 13-page order largely holds onto the spirit of the executive orders issued by the President, with some caveats. Using the text of the decision, below is what the Supreme Court said in the grant, followed by the potential effects of those decisions, what all this means, and what happens next. Earlier this year, President Trump issued two executive orders restricting travel to the U.S. on foreign nationals from Iran, Libya, Somalia, Sudan, Syria, and Yemen. Executive Order 2 (EO-2) “directs that entry of nationals…be suspended for 90 days.” The travel pause, as it’s called by the government, “is necessary to ensure that dangerous individuals do not enter the United States while the Executive is working to establish ‘adequate standards…to prevent infiltration by foreign terrorists.’” In EO-2, President Trump also capped the number of refugees in fiscal year 2017 at 50,000. It bans “any entries in excess of that number,” regardless of country of origin or circumstance. What did the John Doe and the Dr. Elshikh sue President Trump for? Violating the Establishment Clause of the First Amendment. They believe his order “was motivated not by concerns pertaining to national security, but by animus toward Islam” because the six nations targeted are predominantly Muslim countries. Two lower courts – the 4th and 9th Circuit Courts – agreed the orders seemed motivated by anti-Islamic sentiment because no immediate threats to national security came from those nations. As evidence for the existence of “animus,” the 4th circuit relied upon President Trump’s statements as a candidate. The 4th and 9th Circuits put an injunction, or stop, on enforcement of Trump’s executive order. The Trump administration gets the day in Court it wanted, but they received a qualified victory. The Supreme Court’s stay on the injunction allows parts of the executive order to take effect, “with respect to foreign nationals who lack any bona fide relationship with a person or entity in the United States.” Not typically known for being prescriptive, the Chief Justice explained relatives of Dr. Elshikh’s and John Doe’s would be exempt from the travel ban/pause because they have “close familial relationships”, which will make them eligible for entry. Further, if a student was accepted to the University of Hawaii or foreign-born employee accepted a job at an American company, these groups will also not be denied entry. 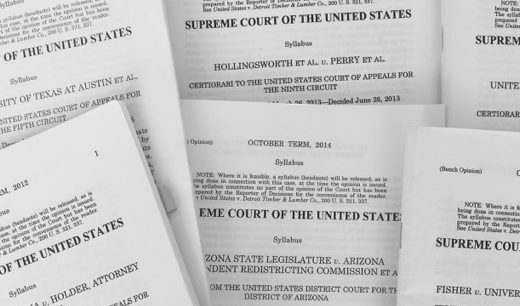 According to the Justices, the lower courts went too far by broadening restrictions in that they “also bar enforcement of 2(c) against foreign nationals abroad who have no connection to the United States at all.” Further, a case-by-case waiver system allows the government to differentiate between those with a connection to the U.S. and those without. Toward the end of the order, the Justices showed they were compelled by the President and government’s interests in “preserving” national security. Speculation and concern that all the Justices agreed with all of the order is shortsighted. It presumes the left-leaning Justices supported the sections allowing restrictions for those without “bona fide” connections. It also presumes the right-leaning Justices supported exceptions to both the reasons for the travel as well as the cap on refugees. Justice Thomas wrote a dissent joined by Justices Gorsuch and Alito saying as much. Both sides have enough reasons to be a little bit happy and unhappy about this order. It’s what comes next, once the case is argued and decided likely next year, that will determine a true win-loss outcome. The problems this order presents are thorny, but temporary. The Court gives deference to the government to decide who is and is not “bona fide.” Such deference has often been given to presidents by the Justices, particularly when national security is at stake. However, subjectivity makes applicants vulnerable to determinations made by government officials as to what will qualify as a legitimate – or, perhaps thornier, what is an illegitimate – connection, which is likely to spur more lawsuits. Given how backlogged courts are and the glacial pace they tend to move, this seems rife with potential for problems. We need only wait until October for this case to be heard and a judgment to come before the end of next term to learn if the Justices believe the president has overstepped his authority. Oral arguments and a decision are expected after the October start of the Court’s term.